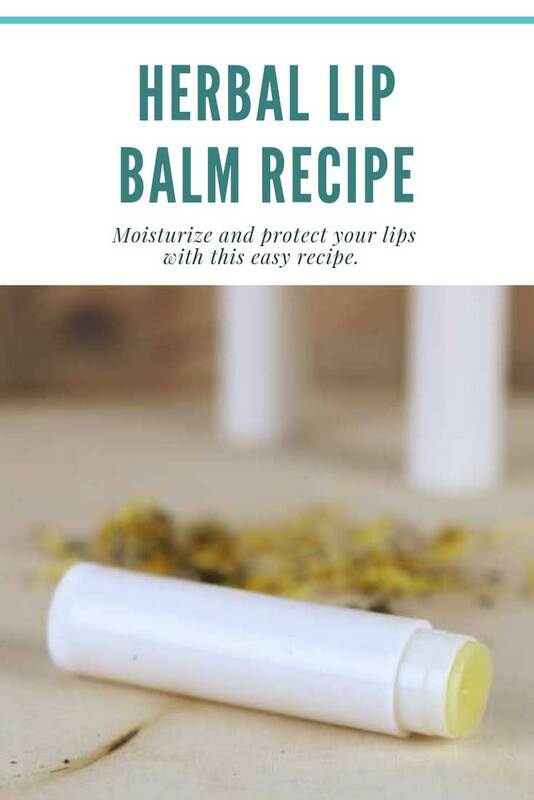 This herbal lip balm recipe has herbal infused oils, natural butters, and beeswax to moisturize and protect your lips naturally. Use calendula, plantain, and comfrey to naturally soften your lips. One reason I love making DIY bath and body products is because I can be creative with the ingredients. For example, I can start with a base recipe for lip balm that has beeswax, butters, and carrier oils and then choose the best butters and carrier oils for my needs. To further customize my lip balm, I can add essential oils and infuse the oils with herbs. This gives the ingredients I choose the benefits of the essential oils and the herbs. 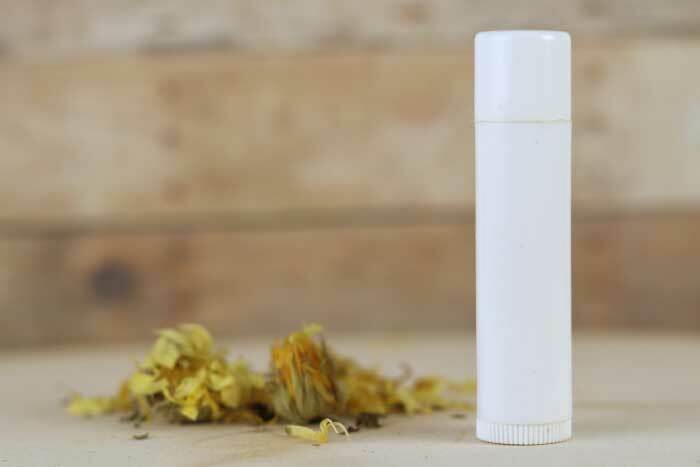 For this recipe, I wanted an herbal lip balm made with calendula, plantain, and comfrey because they help the skin heal and protect it from future damage. In the winter, my lips are dry because of the cold hair. But in the summer, my lips also get dry because of the sun. Basically, my lips are dry all the time except for three days in the spring and another three days in the fall. If you're new to making lip balm, this probably isn't the easiest one to make because it has more ingredients than other lip balms. You'll also have to infuse the oils, which can take up to two weeks. If you're looking for a basic lip balm recipe, I have an easy lip balm recipe included with these gift set recipes. 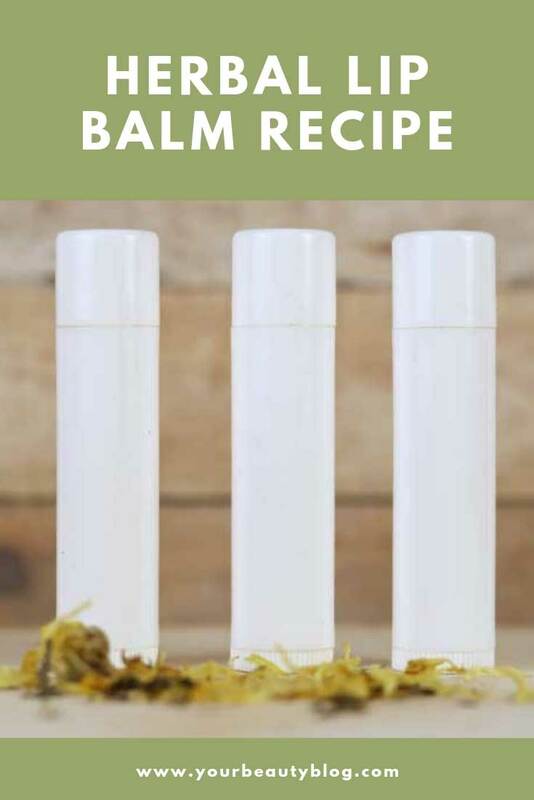 I chose each ingredient for this herbal healing lip balm recipe for its unique properties. There are three herbs that I love for their healing powers, and I think that they work well together. They are the same herbs that I used in my Amish Black Drawing Salve recipe. I infused them in olive oil for that recipe, and I used castor oil in this recipe. You could use either oil in either recipe, so you can make extra herbal infused oil and use it in both recipes. Calendula is one of my favorite herbs. I used it in this coconut and calendula sugar scrub and this calendula soap recipe for dry skin. Calendula is a proven wound healer. It's believed that it increases blood flow to the area, which helps wounds heal. However it works, it makes for an amazing herb to add to your herbal lip balm recipe because it helps heal chapped lips. Comfrey is also considered a healing herb. It helps decrease dryness and flakes, so it's great for moisturizing dry lips. If calendula is my favorite herb for healing, plantain is a close second. In the summer, my lips get crazy irritated if I'm in the sun too long. Plantain is said to provide relief for sunburns. It also aids in healing the skin much the same way that calendula and comfrey do. It's naturally antibacterial and can detox the skin by pulling out toxins. If castor oil brings back childhood memories of being sick, then this post may be painful for you, and I'm sorry. Castor oil is high in fatty acids, so it's very moisturizing for your lips. These fatty acids promote the generation of new skin cells, so like the herbs, it's also healing. It's a humectant, so it pulls moisture from the air to your lips. It's also fairly inexpensive and easy to find. You can find it in most drug stores or big box stores. Learn more about carrier oils and their benefits. Shea butter is a wonderful butter for your lips. Its very hydrating and moisturizing, and the vitamin E in it is a great antioxidant. It's high in vitamin F for skin elasticity. This is important because your lips probably get a lot of sun, which can cause signs of aging. I used cocoa butter because it helps form a protective barrier on top of the lips. This helps moisturize your lips, and it helps your lips retain the moisture they do have. Cocoa butter is high in fatty acids that moisturize your lips, and the antioxidants help prevent the signs of aging. Learn more about hair and skin butters and their benefits. Beeswax serves two purpose in this recipe. 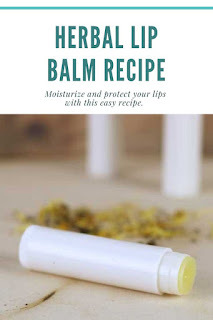 First, it thickens this herbal healing lip balm recipe. Without beeswax, you'd never be able to put this recipe in a lip balm tube. The second reason I added beeswax is because it forms a protective barrier on your lips. Your skin has a natural barrier, but your lips don't. Beeswax forms a protective layer. This helps trap in moisture and prevents moisture loss. First, you'll have to infuse the herbs and the oils. 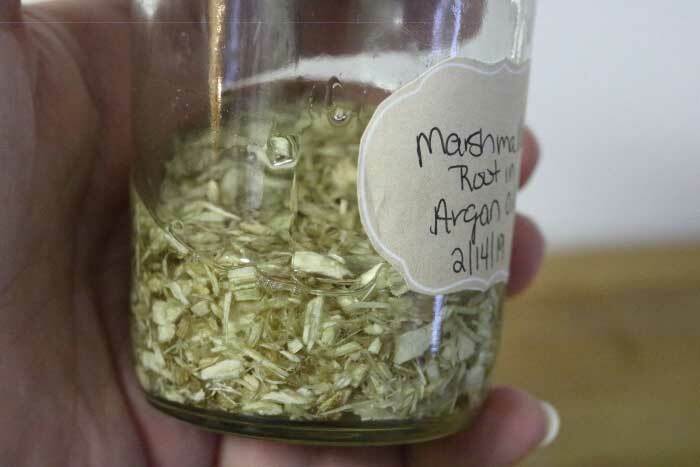 Start by placing about 1 tablespoon of each herbs in a mason jar. Cover with at least 4 ounces of castor oil. Let sit in a dark place up to two weeks. Gently shake the bottle each day to mix the herbs and oils. Strain the herbs out using cheesecloth . Discard the herbs. Save the herbal infused castor oil for the next step. I forgot to get a photo of the herbs in the oil, but this is what it should look like when the herbs are covered with the oils. In a double boiler, combine the beeswax, shea butter, cocoa butter, and herbal infused castor oil. Use a digital scale to measure the ingredients. Heat over medium heat until melted. Stir often. Carefully remove from heat and pour into lip balm tubes or lip balm pots. Let sit until fully hardened. Your herbal lip balm recipe with calendula, plantain, and comfrey is ready to use as soon as it's cool and has set up. Strain the herbs out using cheesecloth. Discard the herbs. Save the herbal infused castor oil for the next step.